For anyone out there that has made their way though Stephen King’s Dark Tower opus, you know that the last three books have definitely split the Constant Reader’s opinion. 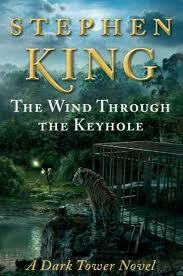 Many feel that King went way over the top by inserting himself into the narrative, while others didn’t mind it so much, and just wanted to go with the flow of the tale. Personally, I didn’t care. I just wanted to know what was up on at the top of the Dark Tower, and who from Roland’s Ka-Tet would make it there. 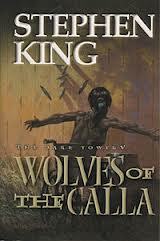 The first time I read Wolves of the Calla, I was surprised at how much I enjoyed it. And I found that I still enjoyed it this time around. Its a much lighter (and shorter) book than some of its predecessors, that takes place over a short 30-day time period. A quick refresher: Roland and his friends find themselves in the small, idyllic town of Calla Bryn Sturgis. The townspeople need the help of the gunslingers: in 30 days, “wolves” from Thunderclap will come and take half of their children away, only to have them returned “roont” (i.e., mentally and physically changed, and not for the better). The good folks of the Calla want the gunslingers to help them stand against the Wolves and save their children. Its a classic western tale — taking many plot points from The Magnificent Seven/The Seven Samurai, as well as Star Wars, Harry Potter, Marvel Comics, and even King’s own ‘Salems Lot (with the re-introduction of Father Callahan, the vampire-fighting Pere of the Calla). 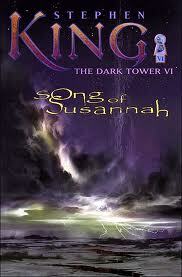 Song of Susannah, however, was my least favorite Dark Tower book when I first read it. And I can safely say that it will always be my least favorite. As a character, and a member of Roland’s Ka-Tet, Susannah Dean has never been all that interesting to me. And having an entire book be more or less about her doesn’t help. A quick refresher: Susannah finds a new personality has taken over her body — that of Mia, who is pregnant with a child that belongs to The Crimson King. Mia and Susannah are transported through the magic door in the Calla to deliver the baby in New York. The Ka-Tet splits up: Roland and Eddie go to Maine to find Calvin Tower and make sure he sells them his vacant lot, and Jake and Pere Callahan (and Oy!) go to New York to find and help Susannah (and really, only appear briefly in the book). And oh, its also when Stephen King becomes a major character in the story. I’m about to start the last — and most controversial — Dark Tower book. I remember not minding the ending the first time I read it…we’ll see if that hold true this time or not. Lastly, recently Aaron Paul announced that he’d love to play Eddie Dean if these books ever really get turned into a movie. How perfectly wonderful would that be? Four stars for Wolves of the Calla. Two stars for Song of Susannah. Five stars for Aaron as Eddie. You can read more of my reviews on my blog. So I’m making excruciatingly slow progress through theDark Tower series. But I love it. I really do. The Drawing of the Three is basically the book whereRoland makes some friends. Most importantly, he makes two friends. Eddie Dean the heroin addict and Odetta Holmes, the Lady of the Shadows. What really stood out was how Stephen Kingwas able to thrust Roland into a world I understand, our modern, American world, and make my own world feel foreign to me. Eddie and Odetta, Roland’s new companions, seem like poor choices of companions. Neither of them are as strong or focused as Roland. And more importantly…neither of them particularly want to be there, with Roland. Joining his journey offers them some advantages; but they still miss home. The comforts of their old lives – the drugs, the mental illness, the power that money gave them. They need to learn to navigate their own personalities, their strengths and weaknesses, all over again, with their new strange friend Roland. It’s a frightening prospect, and I’m excited to see how it plays out. Witnessing Roland’s weakness was also important. 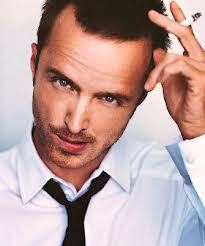 When I am truly intrigued by a hero (or potential antihero), I want them to show me something weak. Or something more human. Roland couldn’t cure his own infection. And the care that Eddie took to save Roland was as much of an insight into Eddie as it was into Roland. Roland is fearful of the assistance of others, and he’s not the kind of person who takes on the baggage of others. But now Roland is saddled with two companions who are motivated by things he does not fully understand – love, drugs, mental illness. They don’t share is singular motivation of finding the tower. And that will be a challenge for Roland, their leader, moving forward. DISCLAIMER: Hey, so don’t read this book unless you want Progidy’s Firestarter stuck in your head until you finish it. True story. 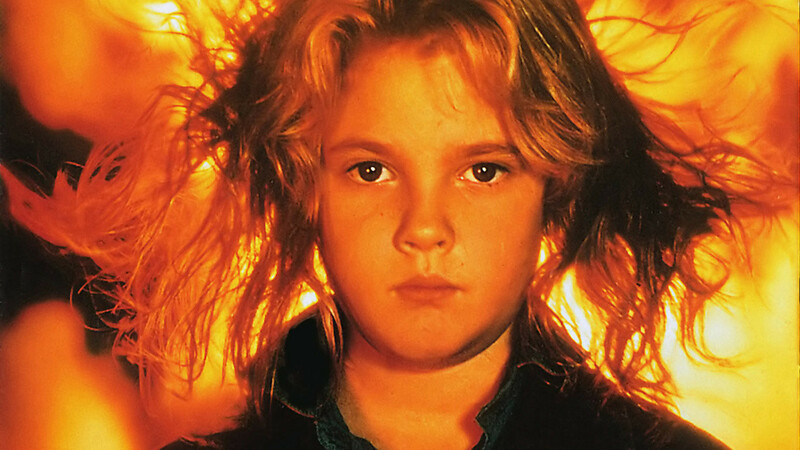 Firestarter is the sweet coming of age tale the almost completely tragic tale of Charlie McGee and her father Andy, both on the run from a super scary government agency called The Shop. We soon find out the reason they’re on the run (and I don’t think I’m spoiling anything by telling you this, since it’s on the book jacket): Andy has telepathic powers and can “push” people into doing his bidding (AWESOME) and Charlie can start giant, uncontrollable fires, which seems like a really safe thing for a kid to be able to do. Andy and his wife (who also had powers) got their abilities when they participated in an experiment called “Lot 6” in college. They did it to make some extra cash and got psychic powers in the process, which is pretty great, except for whole “the government wants to kill me and steal my daughter,” thing. The Shop, obviously, wants to kidnap Charlie so they can do creepy experiments on her and, for whatever reason, her dad is like, “um, yeah, no thanks.” But The Shop doesn’t care. The Shop does what it wants! But their guns are no match for THE FIRESTARTER! She can start FIRES! Whenever she wants. Or, accidentally, whenever she’s too upset. And, you know, kids never get upset about stupid things so I’m sure all of her fires are totally intentional. Right. Sure. 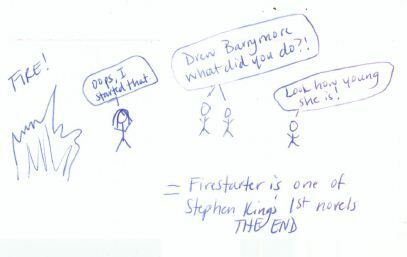 Here’s the thing about Firestarter: for a Stephen King book, it’s remarkably tame. I mean, sure, there’s all this violence against a child, as well as murder and mayhem perpetrated BY the child, but in the grand scheme of King’s universe? It’s nothing. There is an icky bit about a grown man being sort of in love with Charlie, but even that isn’t as gross as I’d expect it to be. This is no IT, you guys. I probably should have been more disturbed by it, because Charlie is adorable and sweet and all these terrible things happen to her, but I think years of reading Stephen King and watching hours of Dexter and zombie movies have ruined me. In which Siege returns to extoll the virtues of Stephen King’s shorter works. The one where King effectively ends a novel. Plus time travel, JFK and a klutzy love interest pulled straight from rom-com tropes. When I first took on the challenge of last year’s CBR3, I decided that I’d attempt to re-read the massive Dark Tower series. I finished the first three books in no time at all…and then, well, there was the fourth book. The fourth book took me so long to finish, that while I was reading it, Stephen King went ahead and wrote a brand new Dark Tower book. Supposedly, this new book would fit nicely between Wizard and Glass and The Wolves of the Calla. And while I was eager to get back to the story of Eddie and Jake and the path of the beam (and Oy! ), I decided to give the new book a quick read and see how it fits into the DT universe. Roland tells them of an adventure he had (not long after the affair of Susan Delgado), where he and his fellow gunslinger Jaime were sent to a nearby town to look into the mystery of what has been killing and terrorizing the locals. Some report they had seen a bear, and some say a wolf. Roland’s been told that perhaps it is a “skin man” — a cursed man that can shift shapes at ease. When the skin man kills dozens at a local ranch, Roland and Jaime find the lone survivor, a young boy who is scared to death. While waiting for a posse to round up some suspects, Roland tells young Bill his favorite story from when he was Bill’s age: The Wind Through the Keyhole. This is a fairy tale, a story of a young boy named Tim who has lost his father and is suffering at the hands of his cruel stepfather, and who risks everything to save his mother. Fans of Stephen King will see many details connecting this simple, yet pleasant tale, to the world of the Dark Tower…North Central Positronics, nineteen, gunslingers, dogans, and our old friend Randall Flagg. Tim journeys through a dangerous land to find the famous Maerlyn the magician, looking for help for his mother. He also finds himself stuck in a starkblast, along with a tiger and a bit of magic. And Tim himself grows up to become a brave gunslinger, the stuff of legends. 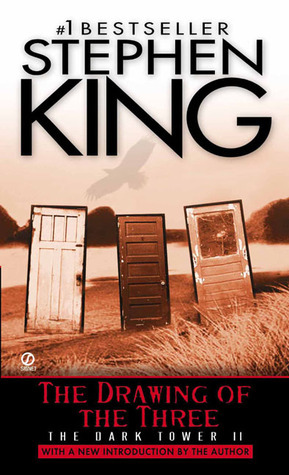 Not the most exciting Stephen King book out there, but a nice bit of storytelling, and it fits nicely between books four and five of the Dark Tower series. What can I say? I feel like I’ve reached the end of my own adventure, heck, the end of an era, instead of just the end of a book series. There were some disappointments, but I’m in the camp that feels the ending was satisfying. My full review is here.